The Oni chorus in In a Grove rehearses a scene entitled The Oni Dilemma. 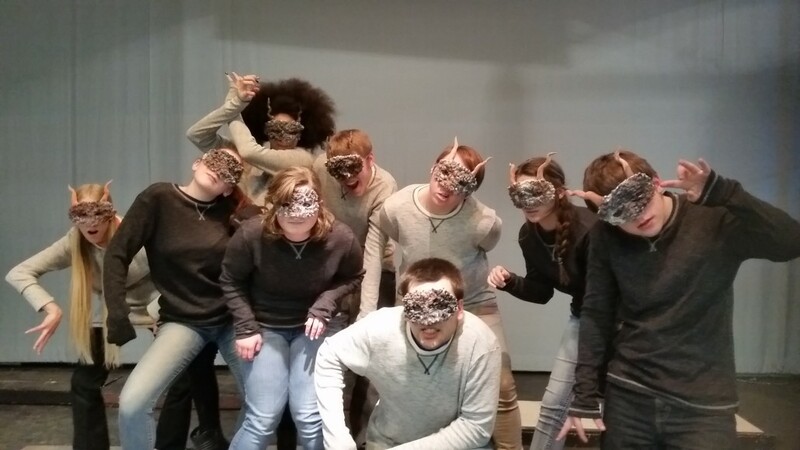 CBNA Theatre will present In a Grove: Four Japanese Ghost Stories by Eric Coble on March 6, 2015 at 7 pm and on March 7, 2015 at 12 pm and 3 pm in the Gerrish Gym on the Coe-Brown Northwood Academy campus. The story begins with Obosan, a traditional Japanese priest, who steps forward from the darkness. He explains that where we now see a grove of trees, bushes, and grassy hills, was once the village of Kogisu, and Obosan was once the village priest. Where did all the people go? What happened to the homes and shops and pathways? Obosan promises to answer all of these questions in four tales as he takes us back in time hundreds of years to watch the supernatural history – and ultimate destruction – of an entire village. Leading the cast is sophomore Cassandra Barnhart as Obosan. The rest of the cast includes seniors Olivia Anatone, Kyle Bousquet, Sophia Chartier, Rachel Dallaire, Hannah Grady, Dylan Groves, Lizzie MacEachern, Jordan Roach, Colton Rush, and Alec Schleich; juniors Janais Axelrod, David Coe, Jessica Cooper, Isaac Guzofski, Damian May, Jared Neal, Stosh Szatko, Emily Therrien, and Ryan Wadleigh; sophomores Sierra Brady, Lauren Burrows, Camryn Chick, Joe Guptill, Arianna Jones, and Kelsey Wallace; and freshmen Sandra Black, Erin Boodey, Zachary Helm, Nina Laramee, Cailinn Monahan, Kayla Pollak, Allison Rose, and Courtney Snow. The production is directed by faculty member Elizabeth Lent with assistance from faculty member Kolby Hume. Reserved tickets are $8 for adults and $6 for students and seniors and are available after March 2 by calling 942-5531 ext. 237, by email – elent@coebrown.org or at the CBNA main office. Tickets will also be available at the door.